Without breaking our stride we walked straight up the steps, out of the sunshine and into the Cathedral. It was noisy and busy which made it difficult to concentrate on the enormity of the moment. I had been 31 days on the road, walking towards this place. For what, I wasn’t sure. I was grateful to be here of course; for the strength and fitness that made it possible to walk 500 miles; for the friends made along the way; for the story and tradition of the road we had walked and for the special gift of Robbie’s company over the last week. We wanted to share the experience with his brother so we called him in New Zealand. Robbie went to find water and still I sat there, gazing at the extravagant gold altarpiece built to glorify St James. Waiting. It was only 10.45am but already people were filling the 1000 or so seats. Friends and familiar faces from along the way arrived, wandering dazed down the aisles, and we greeted one another and hugged. It was emotional. Visitors, pilgrims, nuns and locals packed into every space and still more arrived and crammed in around the walls. The chatter and sense of expectation grew louder. Then we were hushed. The pure sound of a solitary voice echoed round the ancient walls. We listened, captivated, then tried to copy her as she taught us to sing alleluia to the beautiful cadences. The magnificent organ heralded the arrival of the priests. And the mass began. 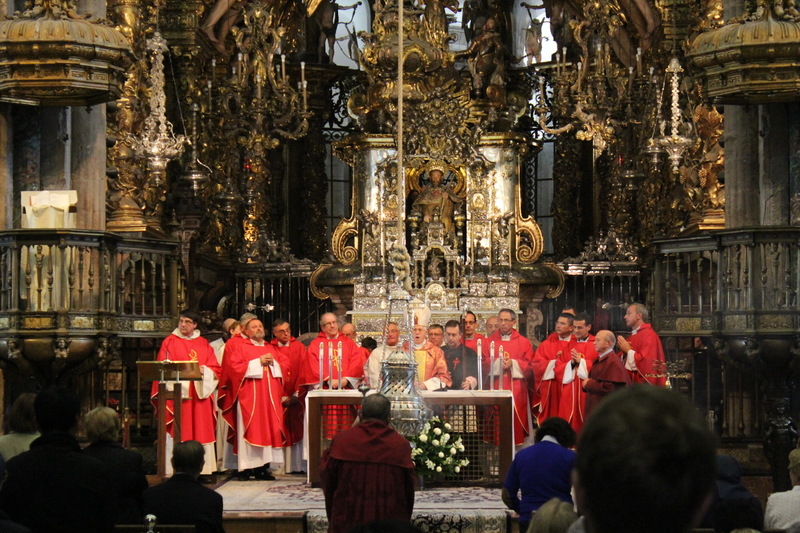 At the end the huge incense burner, the Botafumeiro was lowered to the fanfare of the organ then the tiraboleiros – the red coated attendants – took up their positions on the ropes and began to pull downwards. The choir sang. 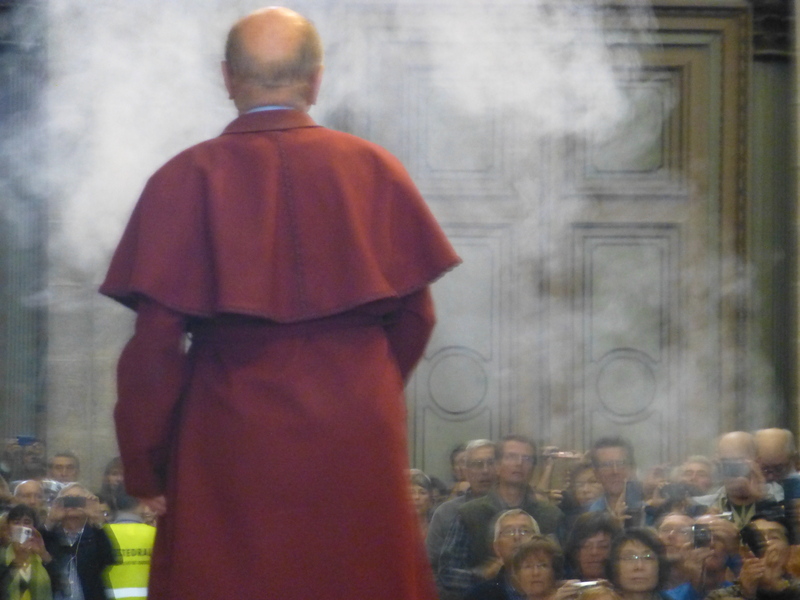 I hadn’t dared hope we would arrive on a day when the Botafumeiro was swung. Scores of people rushed up the aisle to watch and photograph it as it picked up speed and rocketed over our heads, drifting streams of smoke as it flew. And then it was over. We laced up our boots and loaded on our packs. We still had to find beds for the night. Wow – these are the experiences that we are looking forward to! The entire mental and physical challenge of the walk and then the added experiences along the way as well as at the end of each day…. Can we really be prepared for it?? 🙂 We are getting excited and nervous all at once! 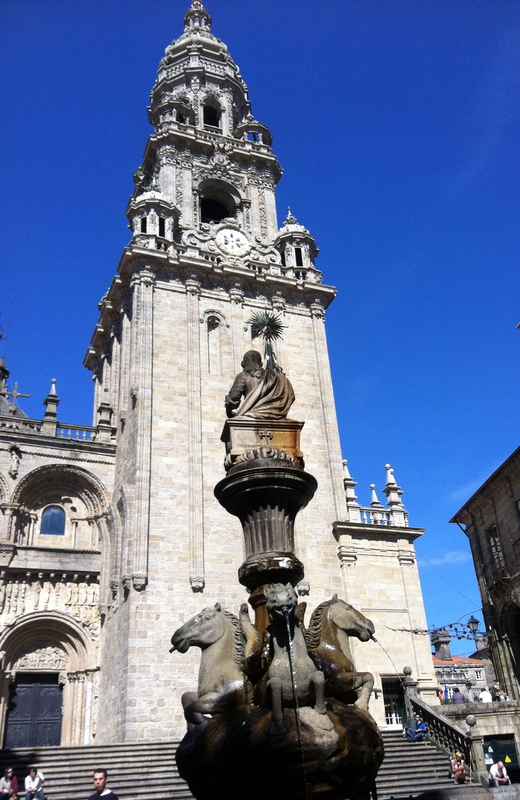 Walking the Camino has been one of the biggest and best experiences of my life – so far! The problem is that I still find it hard to move on and am constantly lured back to pore over photos, diaries, maps and websites. It’s just a matter of time till I return. That nun do have one of the best voices I have ever heard!